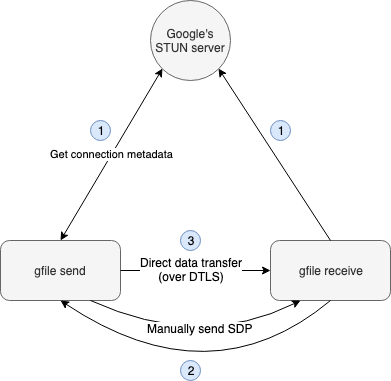 gfile is a WebRTC based file exchange software. It allows to share a file directly between two computers, without the need of a third party. This project is still in its early stage. The STUN server is only used to retrieve informations metadata (how to connect the two clients). The data you transfer with gfile does not transit through it. gfile is able to benchmark the network speed between 2 clients (1 master and 1 slave) with the bench command. For detailed instructions, see Sender and Receiver instructions. This feature is still an experiment. A web interface is being developed via WebAssembly. It is currently not working. In order to obtain a more verbose output, it is possible to define the logging level via the GFILE_LOG environment variable.